End of the zucchini in your garden and time to start warming up the houses in parts of the US. Here is a recipe that is light enough to satisfy the palate for the Indian Summer we are having in Southern California and warm the houses and bellies for those of you in Buffalo and across the northern part of the country. 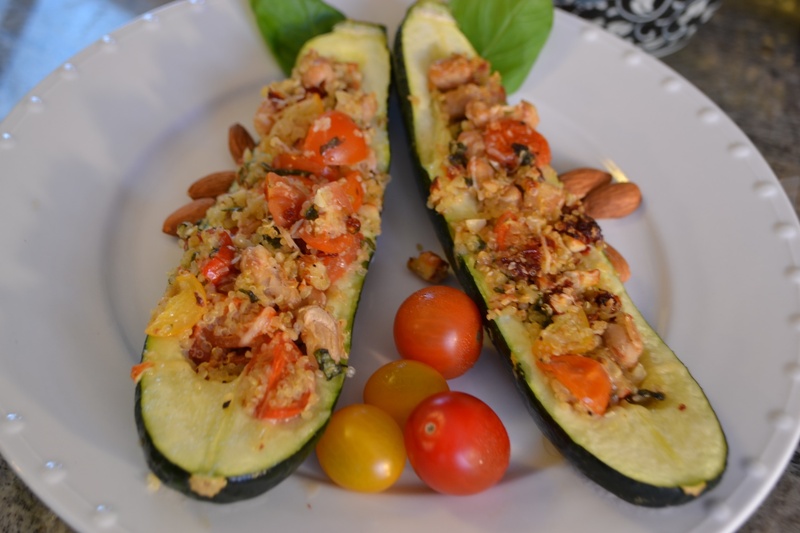 Prepare the Stuffed Baked Zucchini or any of the other wonderful recipes and and you'll find yourself saying "That's Vegetarian?!" In a large saucepan, spray the bottom with olive oil, put in the quinoa and toast for a few minutes over a medium high heat. When they start to brown, add the water/broth and bring to a boil. Reduce heat to low, cover, and simmer until the quinoa is tender and the water is absorbed, 12 to 15 minutes. When the quinoa is cooked, fluff and fold in the beans, tomatoes, almonds, garlic, ½ cup of the Parmesan, and 3 teaspoons of the oil. Spoon the mixture into the zucchini. Top with the remaining teaspoon of oil and ¼ cup Parmesan. Cover with foil and bake until the zucchini is tender, about 25 to 30 minutes. Remove the foil and bake until golden, 8 to 10 minutes. 10PP for a full zucchini. 5PP for half. Reduce to 9PP by using half the amount of almonds, and 8PP if you use only 1t olive oil and a little spray on the top.